Ok everyone. Here is another reason why I hate tumbler (sorry, I do!) After going through several that linked to someone else's tumbler, and then someone else's, etc, etc, etc....I came to a dead end. NO ONE credits ANYTHING to ANYONE on Tumblr. It's frustrating. On both sides I'm sure. I would loooooooove to know who the artist is of this piece. Or at least where to buy it. And as an artist, I'm sure they would looooove to get credit for their work when someone uses it on their own site. I know I would/do! So, before this turns into a rant (which it could easily do) I will just say...all you's out there...anyone know who/what/where in regard to this lovely piece of art? OMG...someone that understands my utter disdain for Tumblr and peoples lack of crediting images!!!! I get so irritated when I come across a dope photo and I don't know where it came from but here is a tip. This site is a reverse image search engine http://www.tineye.com/ and you are in luck for this image. 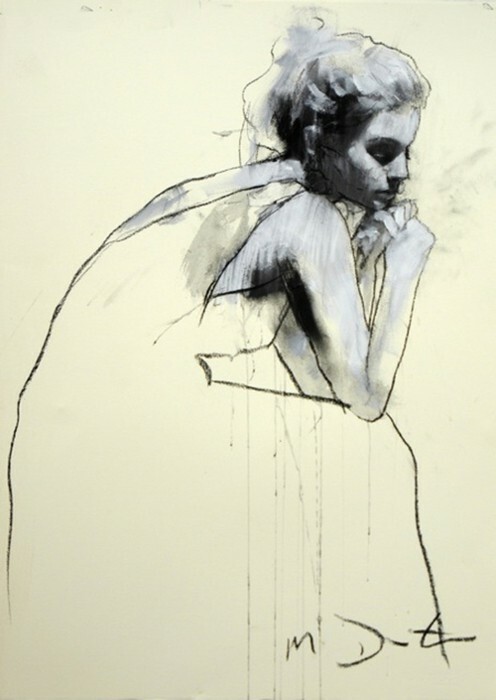 The image was posted on this site http://3ate4.blogspot.com/2011/01/mark-demsteader.html and as you can see the artist name is Mark Demsteader. Sadly tineye doesn't always find the images you're looking for but it's definitely a start. Have a fantastic day!